“Silence in the face of bigotry is acquiescence,” Emory Professor of Holocaust Studies Deborah Lipstadt said at an Oct. 29 gathering to mourn the 11 victims of the Pittsburgh synagogue shooting. 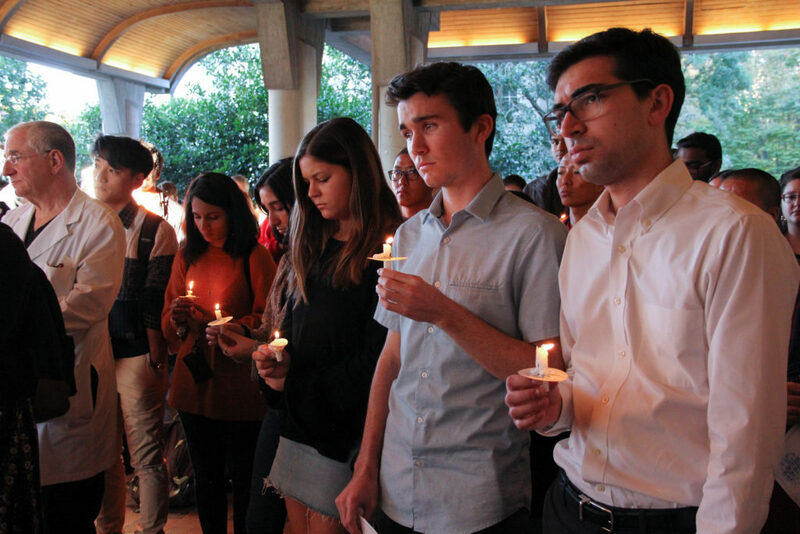 In wake of one of the deadliest attacks on the Jewish community in the United States, more than 100 Emory community members arrived outside Cannon Chapel. Organized by Emory’s Inter-Religious Council, the gathering consisted of remarks from Acting Dean of the Chapel and Religious Life Lisa Garvin, a candle light remembrance of the victims and a call to support the Jewish community in Pittsburgh, where the shooting occurred, and Emory. The Office of Spiritual and Religious Life collaborated with Hillel, Chabad and Meor to organize the event, according to Garvin. On the morning of Oct. 27, Robert Bowers, 46, allegedly entered the Tree of Life synagogue in the Squirrel Hill neighborhood of Pittsburgh and opened fire on congregants while yelling anti-Semitic slurs, according to The New York Times. Bowers was armed with an AR-15 style rifle and three handguns, killing 11 people and wounding six more before police apprehended him. He has been charged with 29 federal crimes — including hate crimes, the Times reported. Some students and staff at the gathering compared the shooting to the 2015 Charleston church shooting and said that people must come together as both a country and community. Flags at the Atlanta and Oxford campuses will be flown at half-staff until Oct. 31, Sterk said. About 17 percent of Emory’s undergraduate student population and 10 percent of the graduate population is Jewish, according to Hillel. Student Government Association (SGA) joined calls for unity and justice in an Oct. 29 email to undergraduate students. Trump critics, including some Jewish leaders in Pittsburgh, have pointed to the president’s divisive rhetoric as empowering to white nationalists. Trump later told reporters that the attacker could have been stopped if there was an armed guard inside the temple. David Kulp (20C), who helped organize the gathering, told the Wheel he is glad that different on-campus Jewish groups organized the event. “The most important thing is that we all came together to try to make this happen for the students who were affected on campus whether that’s because they’re from Pittsburgh or because they’re Jewish,” Kulp said. Yehuda Sarao (21C), who attended the Monday night gathering, said he was moved by how much of the community unified against the shooting. “[That] isn’t always the case in Jewish history,” Sarao said. Sam Galloway (21B) said he appreciated that people of non-Jewish backgrounds attended. “The fact that people on-campus of other faiths stood up and vocalized support for the Jewish community was one of the most touching things I have ever experienced,” Galloway said. Susanah Lara-Gresty (21C) said the shooting was not only a tragedy, but also a sign of growing gun violence problem.